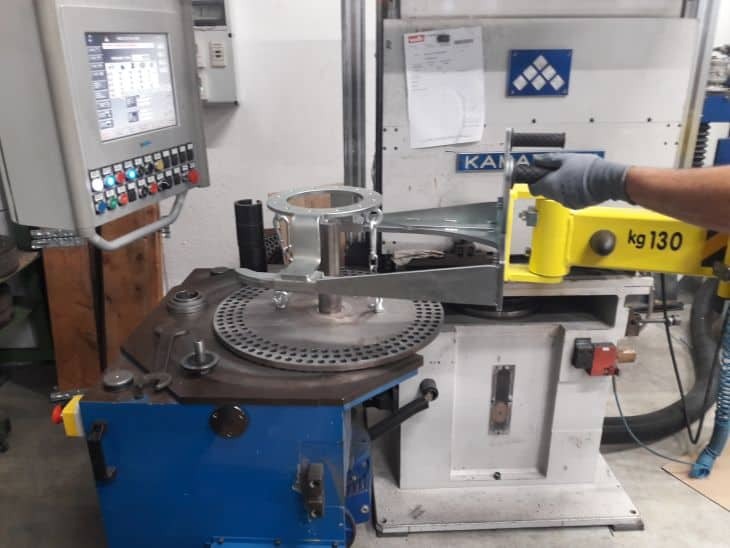 This company produces springs and in order to equip its machine tool, the operator must upload and download both grinding wheels weighing up to 80 kg, and discs with a weight of up to 100 kg, according to the size of spring to be manufactured. This operation has always been quite difficult because the discs are splined on a pin with key and are very difficult to extract, while the insertion was made easy by the gravity force. The operator had to hammer the disc to detach it from its support and, with the help of lift truck forks, slide it along the pin placed vertically for 500 mm until complete removal. With only one operator to carry out the whole task, this operation took a long time, required much effort and implied a medium level of hazard risk, in fact, the operator had to control the lift truck and at the same time make sure the disk wouldn’t get stuck. The extraction/insertion of the wheels always involved the use of an electric lift truck, but the task was difficult to perform because of the limited space available in the machine. 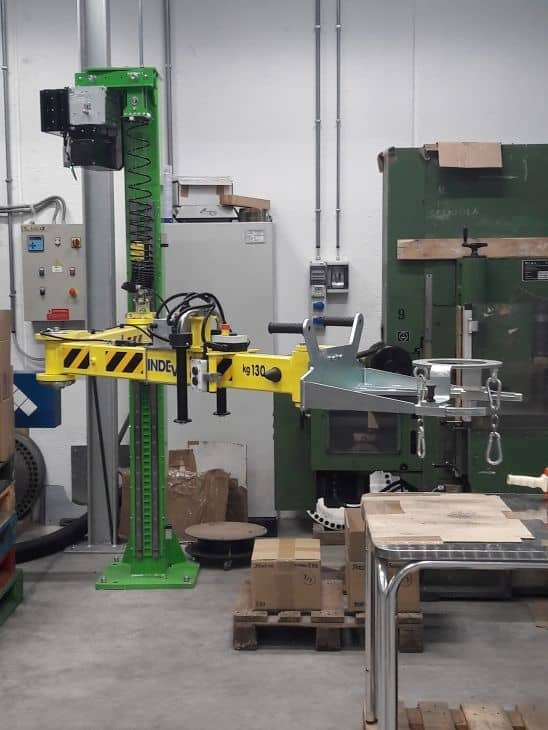 With the wheel resting on the tip of the fork of the lift truck, the operator would align it with the support and then push it (80kg) from the fork to the wheel seat within the machine, then adjust its position from inside the machine. 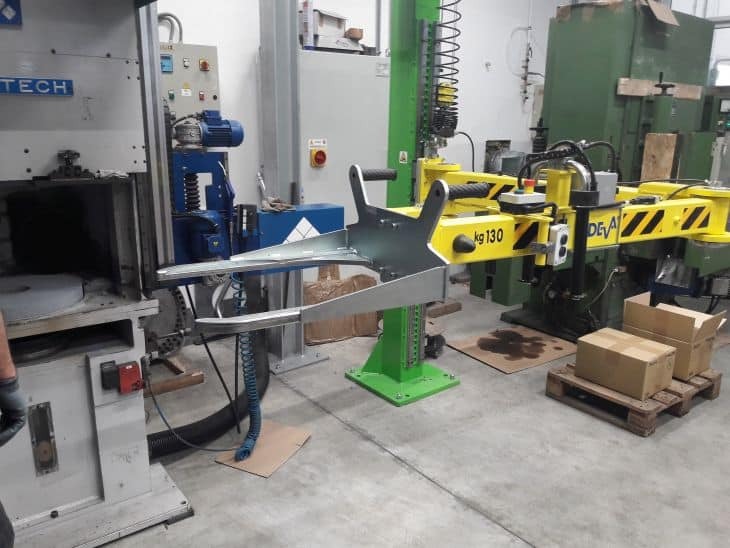 The solution required needed to eliminate any risk hazard involved in the whole operation and make it easier, more ergonomic and safer for the operator to carry out the whole work cycle. 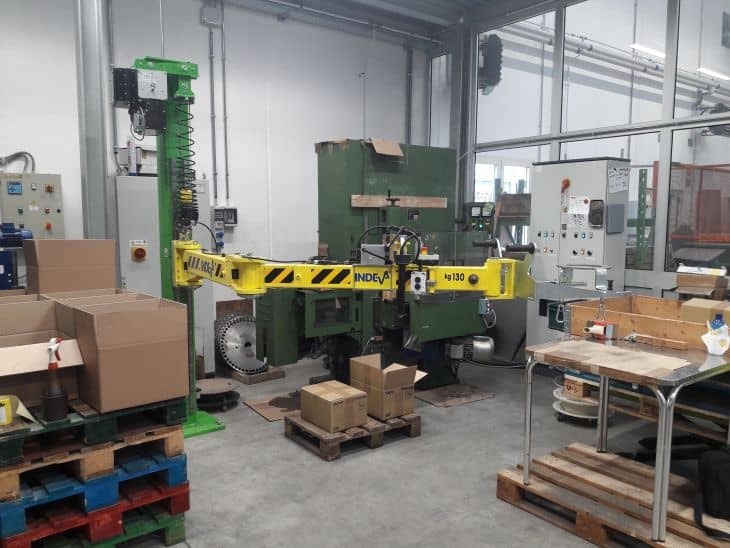 Scaglia Indeva supplied a solution with an industrial manipulator of the Liftronic Series version Linear. Thanks to the electronic control the operator can carry out the whole operation with almost no effort. Movement and positioning of the wheel are precise and easy. The Manipulator arm remains still wherever the operator leaves it, thus avoiding risk hazard given by unexpected moves of the arm. The positioning of the wheel in a restricted area can be carried out easily ’cause the manipulator does not overtravel nor bounce due to inertia force, thanks to the fine electronic control. Now all the procedures have been streamlined and speeded up, and not only ergonomics and safety have been improved but also productivity.